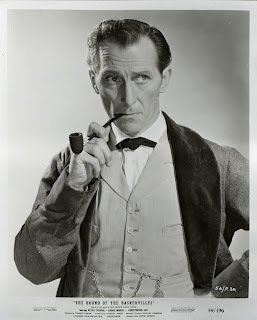 Is he the first Old Purleian to appear thus..
A bit before my time 1946-52 but he did visit the school and spoke to crowd of us in the old gymnasium shortly after his appearance in the film of Hamlet.."
"I was unaware that Peter Cushing was honoured with a stamp. Great. 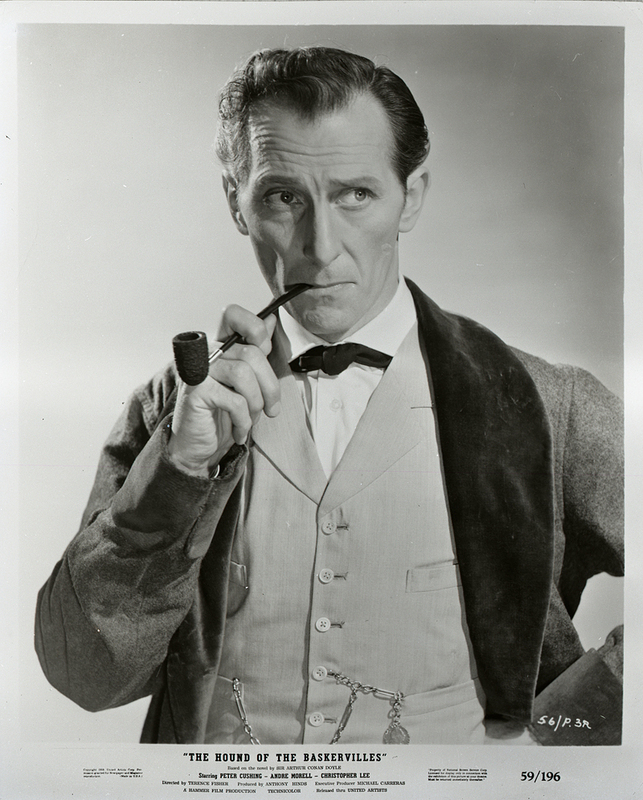 Yes I well remember Peter Cushing coming to the school. We were in the Art class with Mr. Payne that day and Cushing answered questions. I bet he enjoyed the being lauded as he was not yet famous. Acting Osric as a fop won't have been one of his greater moments. I think his visit was before the whole school went over to a Caterham Valley cinema to see the film. Dr Burchall yelled out to quiet us when the school roared with teen testosterone approval at Ophelia (Jean Simmons) showing her thigh when falling on some castle steps. :-)"
Another unknown - please add to the comments box if you can identify where, who and when. Please click to see full sized. 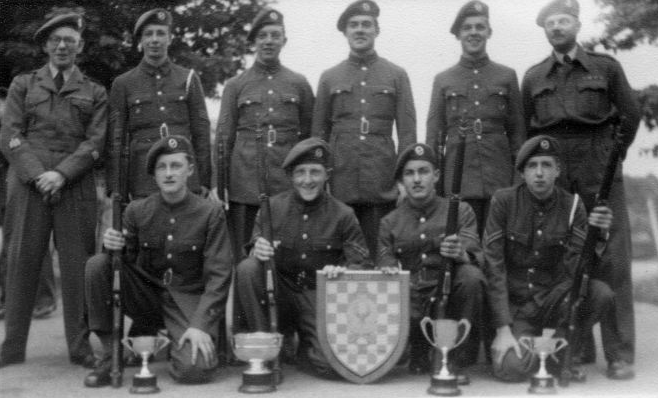 We had four members in the East Surrey Rifle Team that went to the 1954 UK Inter Services Shoot at Bisley where we "cleaned up". Back row R to L Mr Cooke (our C/O), Peter Galyer, Murray Mash, Hugh Jackson. Front row on the left ANO (sorry). The other man in the back row was the caretaker at Reigate GS and he was the man who taught how to shoot. He was an ex CSM in the Queens Regt and a wonderful and truly brilliant guy. Most of became full military standard qualified marksmen under his tuition. How many remember that, thanks to Mr Cooke, we had a .22 rifle range in the school roof*? We would see today's Health and Safety Regs officers fainting at the thought! Editors Note - *the rifle range was in the roof of the school was accessed via a trap door in the ceiling of the Junior biology lab room 5. COULSDON Sixth Form College has been branded "inadequate" by the education watchdog for the second time in 14 months. Ofsted inspectors said results and teaching at the 1,289-student college, in Old Coulsdon, had not improved enough since their last damning verdict in December 2011. The college's principal, David Goodlet, deemed the rating "unfairly harsh" but Del Attah, a governor at the college, said this week: "There have been a number of emergency meetings [since the 2011 report ]. Lead inspector Alex Falconer said: "The proportion of learners successfully completing and gaining qualifications in 2012 was well below recent national averages." Mr Goodlet defended his college, pointing out that the report acknowledged vocational courses fared well and progress had been made. "The frustrating thing is they have said everything we have done since the last inspection is correct but they do not think it is enough," he added. Mr Goodlet said the latest criticisms would spark even more dramatic changes than the last report, since when around a quarter of teaching staff has changed. "Having a second 'inadequate' is absolutely fundamental," he said. "You have to show you are going to improve. It has to be root and branch change." Mr Falconer and colleagues, who visited the college in Placehouse Lane from January 15 to 18, said pass rates at A level were "below national average" and "inadequate" at AS level. He added that advanced vocational results were "better" and around the national average in 2012. Mr Goodlet said the college had tried to improve A-level results by being more selective in September 2012, but that cohort's results were not yet known. He said: "We made it more difficult for students to take A levels here. We lost 100 students through that and they say because we have not got that set of results they cannot look at that. "So we have done dramatic things. Yes, it is against my principles, but we are in a difficult place." Mr Falconer said that "added-value" indicators were also poor, with some students doing worse in academic exams than predicted by their previous results. He said teachers' expectations of students were still sometimes too low, and added no targets for students set by managers since the last inspection had been achieved. Attendance rates also remained a problem, at around 80 per cent during the inspection days. Mr Goodlet said the college had introduced "a raft of measures" to boost attendance, which was normally around 83 per cent. He said: "It has improved but just not enough. We work with bus companies to improve access to the college. We have two extra attendance mentors. "National attendance is 88 per cent compared to 83 per cent for the college. 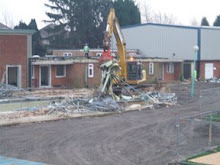 It was three or four percentage points lower than that the last time we had an inspection." Mr Goodlet's suggestion that the college has been dealt with 'harshly' by Ofsted echoes his response to the critical 2011 report. Back then. he told the Advertiser: "One of the things that really sticks in a lot of colleges' throats is the fact that schools and colleges are not judged by Ofsted fairly. "Schools are judged on achievement (who passes the exams) and we are judged on success (who finishes the course). Nowhere has a 100 per cent success rate. We are always looking to improve." Mr Goodlet also described aspects of Ofsted's approach as 'perverse', adding: "If a college takes on more challenged students, it is more likely to have trouble with Ofsted." Any ideas ? - full colour school outing from the 1950's. 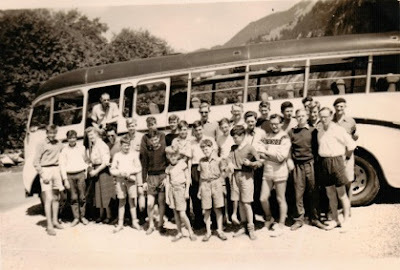 Alan Eversleigh has sent these in from the School Camping outing to Antibes France 1958. Please add names in the comment box below if you know them. 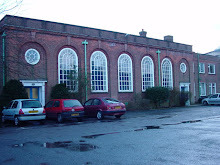 I was very interested to discover the web-site for the Purley School, in connection with an article I was writing for the Bourne Society, on my schoolboy recollections of living in Sanderstead in the 1930s. I recall sitting for the annual Panorama Pictures -- some boys on the righthand side would scurry around behind and be pictured once again on the lefthand side! 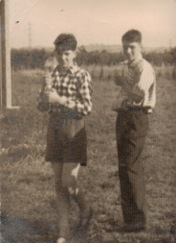 I attended 1936 to mid-term 1940 when I moved to Leamington Spa and attended Warwick School. My memories are a bit hazy now. As a Canadian, I was surprised at the antics of some of the boys in class -- especially in baiting our Geography Master. When he got really riled he would foam at the mouth and there was something of a contest to see who could get him to foam the first. Poor man, he led an awful life! When I googled Purley School a newspaper clipping reported that the incidence of caning was above average at Purley. I don't recall that this was a big issue in my time but some caning was richly deserved! One of the languages offered as an option was Esperanto. I took German instead and I suspect that the demand for Esperanto declined in due course. The School gave book prizes for standing in the English classes and I have two as my sole souvenirs of Purley School, apart ftom my annual report sheets, my blazer pocket bearing the school crest, and my Queen's Regiment cap badge worn by members of the Cadet Corps. We were allowed to propose our book for the English prizes. My first selection was "The Story of Mankind" by Hendrik van Loon, which was quickly approved. In the next year I asked for a two-volume set of "Tales of Mystery and Adventure" by "Sapper". There was some hesitation, but the School gamely accepted the request! I think that the sole activity of the Cadet Corps was drill and marching around. For arms drill we were issued weapons that fitted our size -- i.e. carbines dating back to the Crimean War, with their firing pins removed. 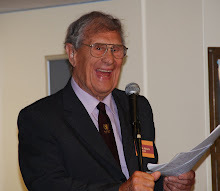 The only other Purley student that I have ever met was the late David E. Cornish of Fredericton. New Brunswick. 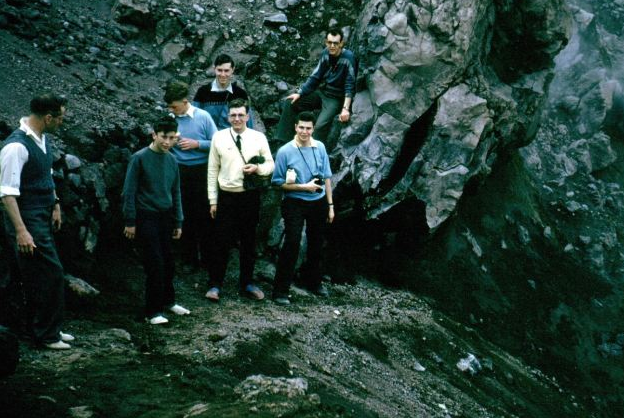 I didn't know him at school (he was in a lower form) but he recognized me at a construction industry ( Maritime Engineering Ltd. ) meeting in the 1950s. 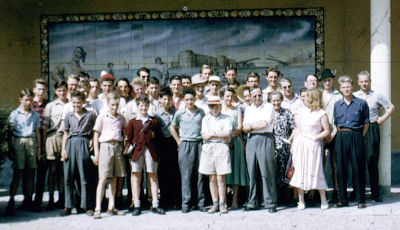 He had been sent over to Canada during the war and stayed on with his adoptive family, graduated from university and in due course established with a partner a construction company. David became a leading citizen in Fredericton, serving as President of the Fredericton Construction Association, Chair of the Hospital Board, etc. and later with me on the National Building Code Committee and the Canadian Construction Association in Ottawa. Well, thank you for taking me down Memory Lane on your web-site. 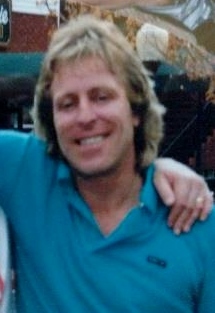 Very sorry to report the passing of Simon Vicary. He died in his sleep last week. He was in the intake of 1966 and made a career in TV in Atlanta with CNN. Simon's funeral will be held at St Peter's Church, Burwood Road, Hersham, Surrey, KT12 4AA on Friday 15th March at 2.15pm. There will be a short service at Randalls Park Crematorium in Leatherhead afterwards for the immediate family.